GB 1976 The Telephone Presentation Pack VGC. Stamps. Free postage! UK A-Z part 2 470 2012. Mint Never Hinged/MNH. GB STAMP ELIZ11 PRESENTATION PACKS-DEFINITIVES AND COMMEMORATIVES-. Dispatched with Royal Mail 2nd Class. Harry Potter ,Royal Mail Stamps ,Presentation Pack ,2018 Issue set of 15 Stamps. Dispatched with Royal Mail 1st Class Letter. GB 2014 CLASSIC CHILDREN'S TV PRESENTATION PACK No 493 SET SG 3552 - 3563 . Dispatched Royal Mail 1st Class. FREE UK P&P. Sent in a card backed envelope to protect your stamps. GB 2017 Postal Museum 'Machin 50th Anniv' Post & Go Presentation Pack LOOK! GB 2017 Postal Museum 'Machin 50th Anniv' Post & Go Presentation Pack FV £4.20. Royal Mail Stamp Presentation Pack - Lest We Forget 2007 - no.405. Dispatched with Royal Mail 1st Class Letter. NICE FLAT EXAMPLE. IN MINT CONDITION. 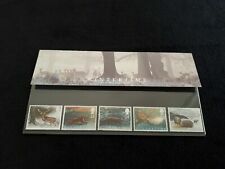 Flags And Armada Presentation Pack Pair Of Mint Stamps GB. Dispatched with Royal Mail 1st Class Letter. Come as a pair of presensation packs. Presentation pack of four mint stamps from Royal Mail in excellent condition and in the original cellophane sleeve. Issued 17th June 2003 to celebrate Prince William of Wales’ 21st Birthday. From a smoke free home. Free postage. SORRY, UK BIDDERS ONLY PLEASE Please see my other stamps and royal memorabilia for sale. 1995 Presentation Pack 257. Europa. Peace & Freedom. 2019 Marvel. Stamp Issue Date: 14th March 2019. We are stamp collectors (and dealers !). based in the beautiful Rhondda Valley in South Wales. Special Version supplied in MARVEL holder as shown. For Stamp Collectors, by Stamp Collectors. Low Value Decimal Definitives. Date: 1971. GB 1995 Presentation Pack No.261. Centenary of Rugby League. Eminent Britons 432 2009 Mint Never Hinged/MNH. You will receive 20 sleeves. Size 220 mm x 120 mm. GB PRESENTATION PACK UNUSED - 2016 ANIMAIL PACK NO. 526. Dispatched with Royal Mail 2nd Class Letter.